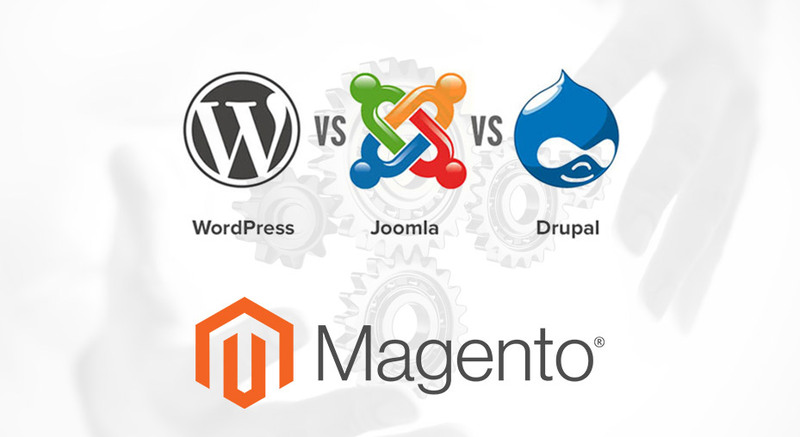 If you are looking for a CMS to build your website, its highly likely that the names WordPress, Joomla, Magento and Drupal have already done a round through the deeper web of your thought process and you have already given a once over to them thinking which one should you be choosing? Although, the options available are wide and varied but getting to know what is best for you can be a bit of a tough job, especially if you are not well acquainted with them. We will be comparing the widely-known, four CMS briefly in this article across the same parameters to give you a clear vision of what you should be opting for while getting new website designed and what are you going to be signing for while choosing each one of them. WordPress is a blogger friendly platform that has been developed at a massive stride rate since its inception. It deploys WooCommerce plugins, comes equipped with a number of templates and hence has been employed in the design of almost 27% of world’s website. It gives the haul of customization in the hands of its users and out of all the four CMS software, is the easiest to use. With an uncomplicated upkeep, WordPress allows the developers to carve out poetry with the designs available without much interference of coding. Contrary to the woo-commerce of WordPress, Joomla is e-Commerce friendly software that has thousands of templates up its sleeves. Looking back at its evolution, since the year of its launch (2005), Joomla has established itself as one of the leading software with millions of websites narrating the story of its success. Its disadvantage over WordPress is the shortage of plugins and templates. It is also a bit complex in its working. However, with a little understanding and practice, working on Joomla becomes straightforward. If you are looking for a website for your company that has more content than average and needs structural flexibility, giving Joomla a thorough thought is what we recommend! If you think your website requirement is to process a large number of data, then Drupal might be the answer to your CMS worries! It is a highly versatile platform that comes with a library of templates and plugins and can process large amount of high quality data effortlessly. The niche of Magento is e-Commerce. It helps creation of online stores, enhances user engagement and enables you to breeze past navigation. It is preferred over other software by store owners as its simplistic approach helps increase conversion rate and sales. Magento though a free source, has been acquired by eBay that looks after its continuous evolution. However, if a dedicated e-Commerce is not in the cards for you, Drupal could be a better; no strings attached option for your website needs. The brief bifurcation entailed above gives a simplistic understanding of the CMS software you should choose. However, there is much more that goes on in the design and development of a website. We recommend you to get in touch with a digital agency that understands your aim and aligns the blueprint of the website structure according to the need of your company.